Some thoughts and observations related to this post by James Raggi, in which he poses the question, "It's not common to make the players make their own map anymore?" Many points were brought up in the comments. I will tackle a few in this post. Player Mapping, undoubtedly, was born out of the original D&D modality which was a miniatures game that focused on combat counters being moved around on a table, with ranges carefully measured, and was highly technical. So for that crowd mapping the dungeon as they went made sense. It fit perfectly well with their previous modality of technical combat, accuracy and careful consideration. However, at the same time Arneson was creating a different sort of game, and one that was focused on story rather than tactics. So there was a divergence right at the beginning. Gygax was focused on the Wargamming aspect, and Arneson was focused on the story aspect. Thus, at the down of the hobby there was a schism that has lead eventually to this spot. Some people do not like the tactical game, but love the story game... and vice versa. So for tactical players and GMs mapping makes sense, and is part of the fun of the thing. But for story gamers, not so much. Philipp Neitzel comments, "If a player says they Take notes of which way they are going or they map the Environment, i usually believe them. If it becomes important we can always roll for it." I like the idea that for the less-tactical games when they say "We map", you take their word for it, and roll to see if the map was accurate enough at key junctures. If they fail the roll then they head the wrong way, and as you're describing it they will begin to figure out that something is wrong. "Where's the stairs up to Level 392??" "Well, you're not sure. What you see ahead is a T split corridor going left and right. What do you do?" "Damn, we must have screwed the map up!?" Of course that only works for tabletop games and would not at all work on a VTT. Also, it illustrates why the players might want to take mapping into their own hands anyway. I'd rather map myself, and not leave our escape route to a die roll, personally. I think I trust my mapping skills more than I trust the dice to stay on my side. So while it might be waaaaay easier to tell the GM "Yeah, we map as we go"... I don't think I'd take that option. All in all, for myself, I notice I have two desires that are in competition when it comes to the question of player mapping. And their juxtaposition suggests quite a bit about the dynamics of the question, imo. On the one hand, as a player, I prefer not to map. For one thing it's tedious. For another, it's error prone, and the results of poorly drawn maps, depending on the world, can be, at times, a serious problem. That said, most of the time, it hasn't been, and errors on maps in terms of lengths of corridors and sizes of rooms have not played a significant role in mishaps. So the question of how important it is for player maps to be accurate comes up, and in my experience it's not important at all. 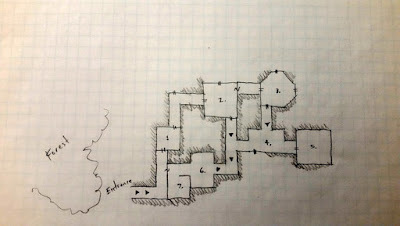 In fact, I think we could probably get a way with very rough maps and still have the information we need to enter the dungeon, and find our way out again. 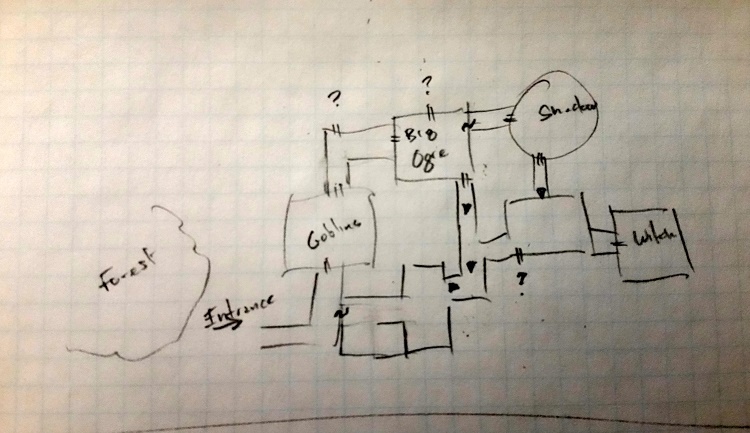 For example, this player sketch map would probably suffice for it's purpose in the game, if that purpose can be defined as "keeping track of the layout of the dungeon so we can get in and out without getting lost". On the other hand, if the purpose is "to govern the rules of tactical combat" in addition to the above, then the sketch map may or may not suffice. For example, corridor lengths and the placement of open doorways may play a significant role in the outcome of a technically detailed combat encounter. In that case a sketch map may not quite do. And if the GM has a more detailed map, and the player's sketch map is flawed, that could make the difference between life and death of characters in some cases. In the end the answer is ... It Depends. What kind of game are you playing? Is it a story game where technical combat is breezed over because no one is very much into wargamming in the group, and such combats are seen as tedious and time-wasting? 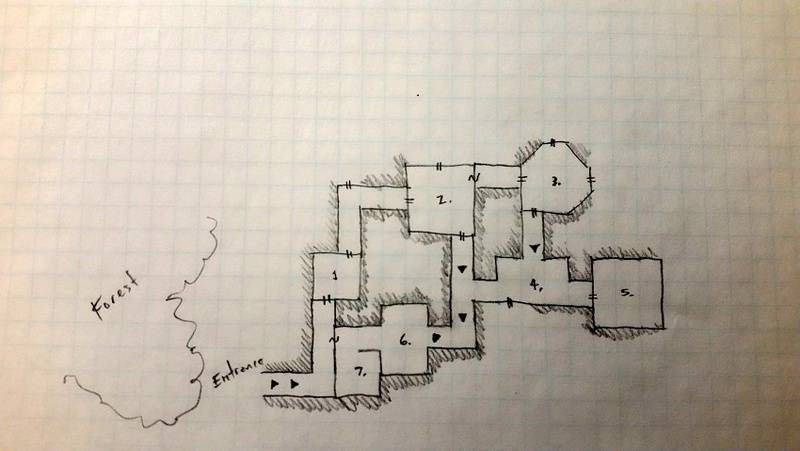 Then, voila... player maps have no particular purpose. But if you're playing the wargame style of RPG, then they very well may... but even then, perhaps not. Again, it depends on the level of detail the GM is enforcing at the table. In the end, and as always, with a game that has so many variations and levels of potential detail, it's really kind of ridiculous to try to assert that one way or the other is "best". And as usual, and always... what is "best" is what you enjoy. Three members of the Miller clan, Shnoggle Miller, JB Miller, and Emitt Snow, having rescued Princess Gwyn from the hands of the monstrous Satyr and blue vested dwarf, found themselves whisked out to sea on the magical skiff. It's beautiful blue black sails unfurled in the wind of their own accord, and as they sailed ever more swiftly out into the Churning Depths, the adventurers watched the Satyr lift his dwarven master onto his shoulder and lope with great speed into the hills south of Bonoville village. Doubtless the villainous duo decided to flee the King's Knights who were racing on horseback down from Bonovilla to rescue the Princess. Having decided not to risk jumping into the water to swim the 200 feet to shore, they began to explore the boat while JB read her Book of Lore. In it she learned that magical boats are often controlled by some magical item, and so they began to explore the boat's cabin to see if they could find such a device as might give them control of the boat. Inside, they found a bed, with a night table, a desk with two drawers, one locked, a cabinet, and a locked wooden chest. The cabin was lit by a single candle glowing with a purple light, and when they looked more carefully saw that the candle was resting on a bed of amethyst crystals. They tried opening the locked chest and the desk drawer but to no avail. At this point Princess Gwyn revealed that she had pilfered a small multi-faceted skeleton key from the dwarf while he struggled to get her into the cabin, and with this she was able to open the door. They tried the key on the chest first. In it they found coins of silver and gold, jeweled necklaces and pearl bracelets. JB claimed the treasure for herself, and an argument ensued. Various hard words passed between the heroes over this, but in the end they agreed to share the treasure fairly at the end of the adventure. The dwarf would doubtlessly been delighted if they fought with each other over the treasure and sank the boat! Calmer minds prevailed. The seas became rough beneath the darkening storm clouds. While they kept a lookout on the cabin roof, and on both sides of the boat, they spied a huge mountain island protruding starkly from the glowering waters. Lightning flashed in the sky as they spotted a gigantic sea monster engaged in epic combat with another monster of the deep. 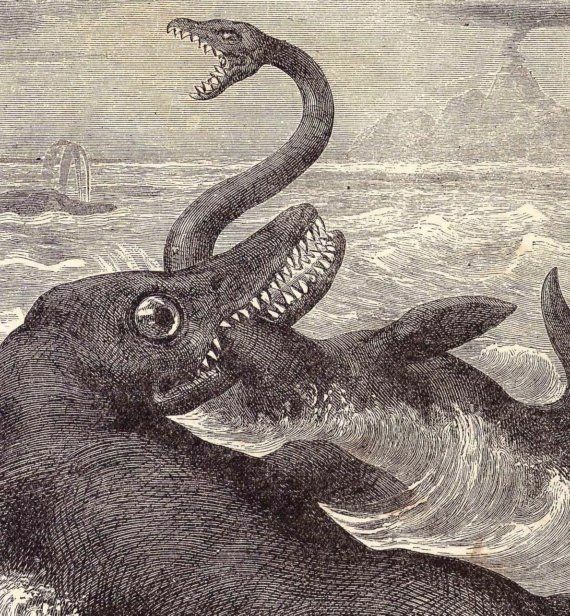 The battle of the giant sea monsters swept the skiff into a whirlpool, spinning the boat around many times before it righted itself. Inside the cabin, meanwhile, things were as calm as if the boat were sitting in a port on a quiet sunny day. It was the magic of the vessel that made the cabin feel still and quiet, they realized. Fearing their presence on the deck was attracting the sea monsters, they all descended into the cabin and shut the door. Eager to see what was transpiring outside, they tore away the tapestries from the walls and discovered the port holes. Out of these they peered into the ever flashing darkness. They watched as the towering mountain island passed away in the night along the port side of the ship. It was a distant silhouette but so steep where the cliffs and stark its appearance they didn't regret not landing there. And on the storm raged. Later they spotted another island head of them, and to this island the ship sailed itself, despite the tempest and the wildly swirling currents. As they gained on the island they noticed that the lamp began to glow more richly with purple light, and as the ship came to shore, the purple light filled the cabin, and even the candle's flame flickered with a plum colored flame. The princess sat sadly on the edge of the bed and began to cry. Schnoggle took pity on her and said some comforting words about how they would most certainly bring her back home as soon as they were able. "Stop your crying," demanded JB. "Buck up and make the best of it." She was trying to get the princess to snap out of her malaise and took that tack believing that if they coddled the princess it would only deepen her gloom and render the girl useless to herself or anyone else. Alas, the poor princess continued softly sobbing and laid herself down on the bed. The boat maneuvered itself through barrier reef and the dangerous shoals into a small harbor along the western flank of the island. JB cast her spell and flew into the twilight sky. The island was about three miles long, and narrow. As she flew the sun set in such a way as to send rays of red light skimming along the bottom clouds of the storm, illuminating the island in a gorgeous glow. The entire island was circled by a beach if white sands, and dividing the island in two was a long line of mountainous ridges and cliffs, along the sides of which a vast dark jungle teaming with giant reptiles, enormous birds, giant apes, chattering monkeys and giant insects hung like a vast green drape. The sounds the wild creatures made became a frightful and wild cacophony. At the top of one of the ridges a flash of purple light caught JB's eye. She flew to it and found that there were a series of table sized amethyst crystals protruding out of the ground gleaming brilliantly in the dying rays of the sun. JB gave each of them a name. "George, Harry, Fred, and you're Bob", she said to each in its turn. And then the sun set, and night began to descend. JB, not wishing to waste any of her magic power, flew to the northern tip of the island where she found a volcanic crater, spewing smoke and boiling with lava deep within. There she spotted another ridge of red crystals glowing in the lava's light. She gave each of those a name as well. "You are Ted, and Harold, and Tom and Wilber", she proclaimed. And with that she realized several hours had gone by and it was time to return to the boat. Though it was very dark, she was able to spot the boat from high up, following its purple glow down to the deck. She entered, quite pleased with herself, and announced that she had named the Island "Joe-Bob-Bill-Fred-Jake Island", and told them about the giant crystals and the volcano, and claimed all the gems on the island as her own. "Finder's keepers," she said with great conviction. No one argued with her about it. They decided to rest and so JB and the Princess shared the bed, while Schnoggle slept on the cabin floor. Emitt, assigned to the first watch, was sitting on the deck when he heard the sound of splashing in the water near the boat. Then another sound of water surging. A few minutes later he heard more splashing on the other side. In the next few minutes the boat was surrounded by sounds from the water, and a enormous bellowing crocodile roars filled the air. Emitt quickly descended into the cabin and shut the door. They watched through the port holes as giant lizards writhed over the boat, at times covering the round windows with enormous claws, giant snake heads with huge glaring eyes, and slithering skins covered with bejeweled designs. All that night serpents, lizards, and giant insects swarmed the boat making dreadful sounds. But inside the cabin, the party felt quite safe, and so they fell asleep after a time and woke up in the morning. As the sun shed warming rays over the sea, JB stood on the deck with Emitt and Schnoggle. There was no sign of the reptilian invaders. Other than the island, there was no land anywhere as far as the eye could see from horizon to horizon. A good night's sleep had restored JB's mystic energies, and so she wished to fly off to see if she could discover any hint of civilization on this lonely and wild island in the midst of the sea. And as she prepared to go, the others thought to try to unfurl the sail, and see if they could sail the boat. But this seemed to them to be futile. The boat was very resistant to these efforts. When they would try to loosen the ropes from the cleats they found the rope turned stiff. And when they tried to pull the rigging, it would hardly budge. It seemed the boat simply had no intention of letting itself be sailed away from the strange, wild, and frightening Joe-Bob-Bill-Fred-Jake Island. And that was were we left the adventurers that day.